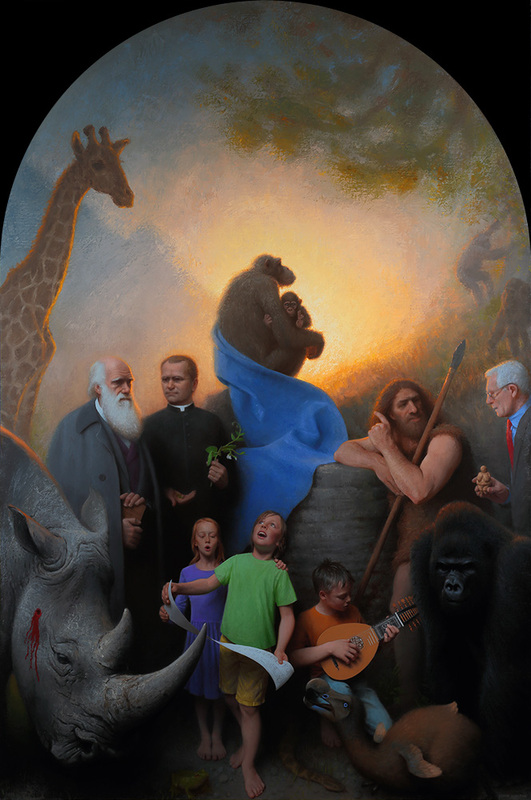 This painting reflects an evolutionary and ecological understanding of the world. It sings a hymn to the glory of nature. It bears witness both to the triumphs of science, and its failures. It offers a blessing (theologically unorthodox and perhaps a little ironic and mischievous, but possibly welcome nonetheless). The moral and spiritual issue at the heart of this picture is our estrangement from nature, and our ecocidal guilt. How far can a work of art go towards addressing that guilt, reconnecting us with nature, reconciling us to our fate, and perhaps our doom? These are my questions. They help define my artistic project. This painting was inspired, firstly, by my love of Renaissance painting, and in particular the pictures of Giovanni Bellini. I've always loved the solemn, tranquil, understated grandeur of his great alterpieces, and have long wanted to emulate them, but didn't feel comfortable with the idea of painting the Virgin Mary or the baby Jesus, or making propaganda for a religion I didn't believe in. I found myself asking: "Might it be possible to take the form and aesthetic language of Bellini as a framework, to follow him in spirit and structure, but with the Christian iconography stripped out and replaced by something closer to my own beliefs?" This painting emerged as the answer to that question. A typical Bellini 'Sacra Conversazione' has the Virgin and Child placed centrally on a throne, beneath which saints and martyrs are gathered, apparently in conversation. Some youthful angels, singing or playing musical instruments, add another element to the composition. The setting is usually architectural but often open-air and suffused with light, suggestive of an overarching order in which God, Man and Nature can exist in harmony with each other, with all conflict reconciled. I've largely followed this format, but systematically replaced the Christian iconographic components with those of the biological sciences. My 'saints' are the founders of modern biology: Charles Darwin, the father of modern evolutionary theory, Gregor Mendel, whose experiments with peas laid the foundations of genetics, and James Lovelock, the founder of earth-systems science or 'Gaia' theory (here holding the Willendorf Venus). My 'martyrs' are the victims of extinction and ecocide. The 'angels' are my own children, joyfully celebrating Nature's glory. At the center, where Christians put God in the form of a human child, I have placed an infant chimpanzee, its hand raised in a blessing. Why? Because I can't go along with the idea of Man made in God's image, or (in its Humanistic inversion) God made in Man's. Because the very notion of divinity is difficult for me, I wished to paint a picture in which our understanding of the deepest mysteries is frankly mocked. It may be asked whether my attempted homage to Bellini and the Renaissance preserves the spirit of the original, or betrays it. My own sense is that my values and Bellini's are surprisingly congruent. The Renaissance was in fact a period of great religious turmoil, widespread scepticism, and a desire for religious renewal that expressed itself in the revival of old cults and openness to strange new ideas. Artists were at the forefront of this movement. Intellectually, Bellini may still have been a Christian, but the religion of his eyes was Naturalism, and this (more than any Christian theological concept) is to my mind what his pictures embody most deeply. This is why, in emulating him, I think it is possible to discard the more overtly Christian content, while still preserving the essential spirit of the work. The intent here isn’t anti-Christian, or anti-religious. In Bellini's day there was no obvious discord between science and religion. It's that sensibility which I'm trying to recover.